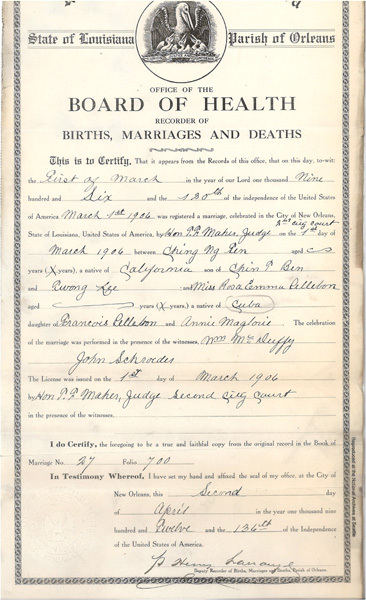 “Marriage Registration, Louisiana, Orleans Parish,” 1906, Chinese Exclusion Act case files, RG 85, National Archives-Seattle, Chin Ng Ten case file, Seattle, Box RS 195, RS 29,167. In 1906 Chin Ng Ten was arrested in New Orleans under the Chinese Exclusion Acts for not possessing a proper legal certificate. He was acquitted when he furnished evidence showing that he had been arrested in St. Albans, Vermont in 1896 and the charge was discharged by Felix W. McGettrick, U. S . Commissioner for the District of Vermont. Immigration Services in Boston verified that McGettrick’s seal and signature were genuine. The discharge did not include Chin Ng Ten’s photograph. Henry Chiapella, U. S. Commissioner, Eastern District of Louisiana issued Chin Ng Ten another certificate with a photo. In 1912 Chin Ng Ten and his wife applied to visit China. Mrs. Chin Ng Ten was interviewed. She gave her maiden name as Rosa Emma Pellebon, daughter of Francois Pellebon and Annie Magloui, born in Santiago, Cuba. Rosa said her father was of the Spanish race. They submitted a copy of their 1906 marriage registration showing they were married by Judge T. F. Maher in New Orleans. Witnesses for the wedding were William McDuffy and John Schroeder. Chin Ng Ten was thirty-two years old in 1912, born in San Francisco, and had been living in New Orleans since about 1903. Before that he lived in Baltimore for seven years. Chin Ng Ten’s 1912 application was approved and he received a certificate of identity #9834. Their visit to China was short–they left in May and came back to New Orleans in December 1912. There is no file for Rosa since she was not Chinese.